Reflections and Ruminations: Fear lies behind our tendency to be dishonest. But what is it a fear of? Fear lies behind our tendency to be dishonest. But what is it a fear of? “Thou shalt not lie” is not a commandment that is specific to Christianity alone. In almost all religions, honesty is upheld as a virtue to be cultivated and lived. Why is this so? We have in us as human beings an inherent appreciation and need for honesty. Its goodness is universally agreed upon and people looking for life-partners want to see honesty in them. Yet, there is ample evidence that dishonesty plagues humanity on so many levels. People lie for all sorts of reasons, and as a confessor, I can vouch that many penitents are burdened and feel guilty for having lied and being dishonest. The Confessional is a place where one reveals to God the ways in which one had not been living in a right relationship with God and with one’s brethren. In dishonesty, which comes in so many forms, the relationship had been lived in some sort of falseness or duplicity, and this simply does not sit well with the penitent. While the celebration of the Sacrament of Reconciliation or Confession does forgive the person for the dishonesty confessed, the more important dimension of this confession is more challenging - to get the penitent to understand the reason behind this dishonesty. After all, one really needs to understand the energy and the rationale for such behaviour before there is true conversion of life and of heart, enabling one to walk and live in a new way thereafter. I have realized that it is not often easy for a person to get to the root of the ‘why’. 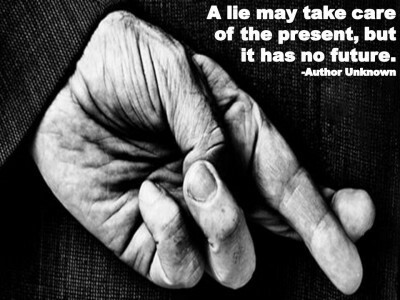 Most people who lie cannot just be pathological liars. There have to be reasons behind this, and just admitting the lie may not bring about a conversion of heart. True conversion requires one to arrive at the root of why one had resorted to living in some form of deceit. I am wont to believe that many times, the under girding reason is fear. Fear of what? The basic fear that one would not be loved, accepted and met with approval if one was truly honest, guileless and ingenuous. The child fears that the parent would not love her if she were honest about not having done her homework so she lies. The teenager is afraid of being rejected and admonished by his parents if he really tells them that he was smoking with his buddies, so he lies. The husband who was really with his friends around the poker table rather than around the meeting table fears that the truth would mean getting the cold shoulder instead of a shoulder of support, so ends up lying to her. Scripture is so right to say that the opposite of love is not hatred but fear. However, scripture doesn’t elaborate very much as to why this is so. But if we are discerning enough, we will see that it is often the fear of being rejected and being denied the security and comfort of love that all human beings seem to need. The good news or the gospel (from the word “god spell”) that Christ has come to cast over the world is that humanity does not need to live in any insecurity or fear because he had come to show how much God loves the world – unconditionally. So unconditional that the cost of their deepest fear (which rejection and abandonment by God) was paid by the very life of God’s himself by the life of his only son. Unconditional love doesn’t count the cost. It bears the cost. Agreed, the layers behind this statement and its implications are many and nuanced, but its truth is what gives one cause to live in honesty and truth rather than in fear, anxiety and deep-seated insecurity. It is only when one is clear about this that one begins to want to live no longer in any duplicity or deceitfulness. One begins also to live in a newfound confidence, not just because lying is wrong (which it is) and because one doesn’t want to ‘suffer’ the pains of hell, but because one is now living in right response to what one has been given unconditionally and without meriting it by one’s own goodness. We hardly trust this truth very much in our lives, and this was seen in the way that our first parents, Adam and Eve were so easily deceived to think that God’s love for them was somewhat still conditional and that something was still held back. This made them fall for the lie. As much as the world does seek honesty, it does not help when dishonest acts get to be commended and rhapsodized and given some sort of ‘stamp of approval’. I recently came across a story of how a radio station in Australia had pranked someone by calling a random number. The DJ of the radio station (there were two on this program) who made the call fabricated a story of how he needed this random person to pretend to be a referral in his job application to an accountancy firm and asked that if he would help him if he were to lie to his would-be employer, and so give the potential employer a good impression of him. This person (it was later revealed that this person went by the name of James) agreed. The other DJ then called James soon after, posing as the potential employer, and asked questions about the person James was being a fake referral for. James lied bold-faced about having known the person for about 10 years, that he was bi-lingual, and that he was good with numbers. The prank was finally unveiled and the truth exposed. One would think that this would end here. But this is where it gets bizarre. The local news station picked up on this, and featured James in their TV show, and had him brought to the station. It turned out that what James did was met with widespread approval from not just the listeners to the show, but even people on the social media. He was hailed as a ‘great bloke’ and a ‘truly great guy’. I am that convinced that knowing that God unconditionally loves us really changes everything in life. Jesus came to show us that. It is what really redeems us. And that is why I always end my homilies and sermons with “God love you”, and pray that one day, this truth will sink in and begin to change our world. In Christian Meditation, we learn that the real tragedy of our time is that we are filled with desire, be it for happiness, power, wealth or success....................whatever it may be then, we are always imagining ourselves as we might be. As such, we seldom come to know and accept ourselves as we really are and also very rarely can we accept our present situation or reality as it really is! In doing thus, we are living in denial or living dishonestly.